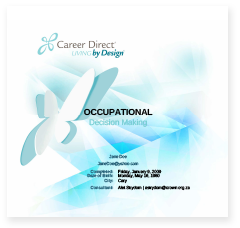 The Career Direct® Detailed Report is only one step in discovering your true calling. While we encourage you to discuss your results with friends and family, our best recommendation is that our specially-trained consultants conduct the Occupational and Educational assessments. As experts in the Complete Guidance System, Career Direct Consultants can help you better understand the detailed report data — pointing out nuances that are often missed. The Basic Report gives an introductory insight into your unique design. These results will help you understand more about your personality, interests, skills and values and how they relate to the career field. Click to see what you get with the Basic Report. 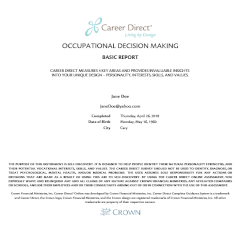 Whether you are a student in high school or college, currently unemployed, or just in need of a more fulfilling career; the Career Direct® Detailed Report is designed to equip you with the information you need to pursue the career path that fits you. Ready to get started with Career Direct®?